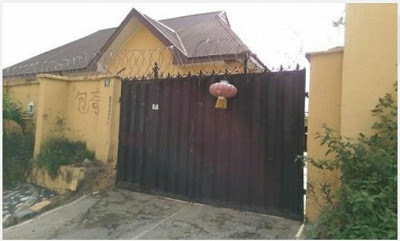 The Chinese supermarket located in Gwarinpa area of Abuja has explained the reason behind its decision to deny Nigerians entry into the premises, saying it is because of their alleged nefarious activities. The supermarket came into limelight on Tuesday when a resident of the area took to the social media to allege that he was denied entry into the premises because of his skin color. The management denied that the decision to ban Nigerians from entering the premises was not geared to discriminate between tribe and colour. It, however, said Nigerians are allowed to enter the supermarket individually and not in groups. The supermarket, which is situated at 9 Bauchi Street, War College Estate, Gwarinpa, is a residential building turned supermarket and without a name, only a Chinese inscription on the fence and a traditional Asian lantern hung on the gate. The gateman at the premises, who gave his name simply as Maxwell, said for more than one Nigerian to be allowed entry into the premises, they would have to be accompanied by policemen. Justifying the management’s decision, one of the attendants, Samuel Azenda, a Nigerian, claimed that the supermarket was robbed by Nigerians in May during which more than N2.5 million was stolen. Azenda said until May, the gate was always open to all and sundry. It was learnt that the owners of the supermarket were currently not in the country as they were said to have been flown to China for medical treatment as a result of the injuries sustained during the robbery. The supermarket attendant, who also claimed to have been beaten during the robbery, said about five personnel were beaten after a group of four armed men entered the premises in May to rob. Azenda further explained that since the supermarket specializes mainly in Chinese foods and items, Nigerians are not their sole consumers but only a few that patronises Chinese products.